How to copy the item to specific location in the output directory in MSBuild Project? In a Project we need to load the external libraries that are located inside an ExternalDLLs folder On the build of the application each dll should place inside an execution directory. But on build of application it creates an folder inside the debug with name ExternalDLLs then it place dll inside of it. 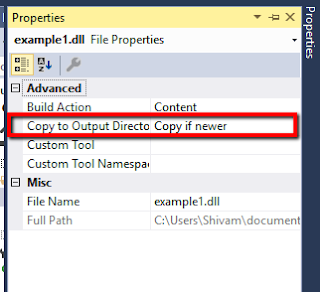 Each dll property "Copy to output directory" is set as "Copy if newer"
Following is the directory structure for output directory as you can see it also create the directory inside the output directory. It will fix the problem and dll under the ExternalDLLs will directly put inside the output directory.